Mr.Shyam is a die heart technology lover.He always tries to buy every latest gadget he found in the markets his friends and his family always try to make him aware of what he is doing, but he don't care about it! (I know he is the biggest dumb person in the world).Then after a month he got this credit card bill, and he was shocked by the statement as the amount of money he has to pay was very HUGE! So what we have learnt from the above topic is not very complicated even a child of one year can understand this (Na !he can't understand) but in short most of the geeks use to waste their money on buying some weird and dumb things that they don't actually required, and if they are intelligent then I am damn sure they would not make this type of mistakes. Buying what they don't really want! Treating Cash as it will grow Again! I’m shocked at the number of geeks I know who spend all day online and then go to Best Buy to buy electronics. This doesn’t apply to every geek, of course, as many have discovered the deals at Newegg, Amazon, Woot, etc. When shopping online, don’t buy something just because it’s a deal. Do you need two mp3 players (but it was $20 you say!)? No. Solution: Once you’ve decided on a purchase, use My Simon or Google Product Search (formerly Froogle) to find the lowest price or try a coupon finder like a deal locker. 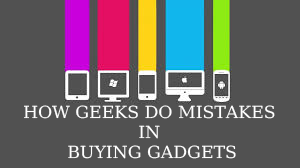 2 comments to ''How a geek can do mistakes in buying gadgets"